Aaron Judge‘s flyball to center field in the fifth inning triggered a crowd crescendo even though it came to rest in a glove shy of the warning track. Let’s go through the best moments from the 2017 All-Star Game. All the living Latin members of the Baseball Hall of Fame to throw out the ceremonial first pitch of the All-Star Game. 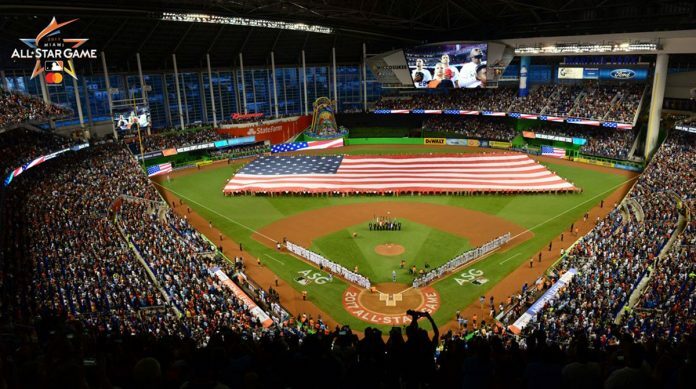 Eight Latin American-born members of the Hall of Fame —Luis Aparicio, Roberto Alomar, Rod Carew, Juan Marichal, Orlando Cepeda, Pedro Martinez, Ivan Rodriguez and Tony Perez— threw out eight ceremonial first pitches. Clayton Kershaw stood in the National League clubhouse before Tuesday’s All-Star Game across from Jose Fernandez’s locker, which serves as memorial to the Miami Marlins’ dynamic right-hander. Fernandez was a two-time All-Star before he died at 24 in a boat crash last September. Among his unfulfilled goals was to start in Tuesday’s game at his home ballpark. Bryce Harper of the Washington Nationals may have the best hair in the majors. During the course of a baseball game, Bryce Harper’s batting helmet falls off his head far more often than the average player. Tuesday night, Harper had a highlight play in the second inning of the MLB All-Star Game. He made a running and diving catch, and then an All-Star hair flip. The Seattle Mariners slugger brought out his cell phone and asked catcher Yadier Molina to take a picture of Cruz with home plate umpire Joe West before his at-bat in the sixth inning. He followed up with a fly out to end the inning. For the 12th time in All-Star Game history, the AL and NL needed extra innings to settle the score. Seattle Mariners second baseman Robinson Cano’s solo home run off Wade Davis in the top of the 10th propelled the AL a 2–1 win, its fifth straight victory in the competition, and evened the all-time tally between the two leagues to 43 wins apiece. It was also the first extra-inning All-Star Game home run since Tony Perez in 1967. Perez was one of the former players who threw out the first pitch on Tuesday night. Here are the 2017 All-Star Game Best Moments. The American League won the MLB All-Star Midsummer Classic, These are the best moments, photos, and videos.